The Digital Quilt 1 was developed in 2014 to ameliorate problems with the contemporary state of the art stitching software. We needed something easy to use in the field, robust enough to handle the rigors of film production and that could get the cameras close together for ease better post production. The proximity of the lens pupils allows for easier stitching on the horizon of a shot. The rig makes an intentional trade off, prioritizing horizon capture, where a viewer is assumed to spend most of their attention, over polar capture. The rig was sold as a product by Digital Quilt and used on numerous productions to great effect. Easy to assembly with only one fastening point. Easy and cheap to manufacture. Only 10 parts including fasteners. Accommodates industry standard camera supports and tripods. 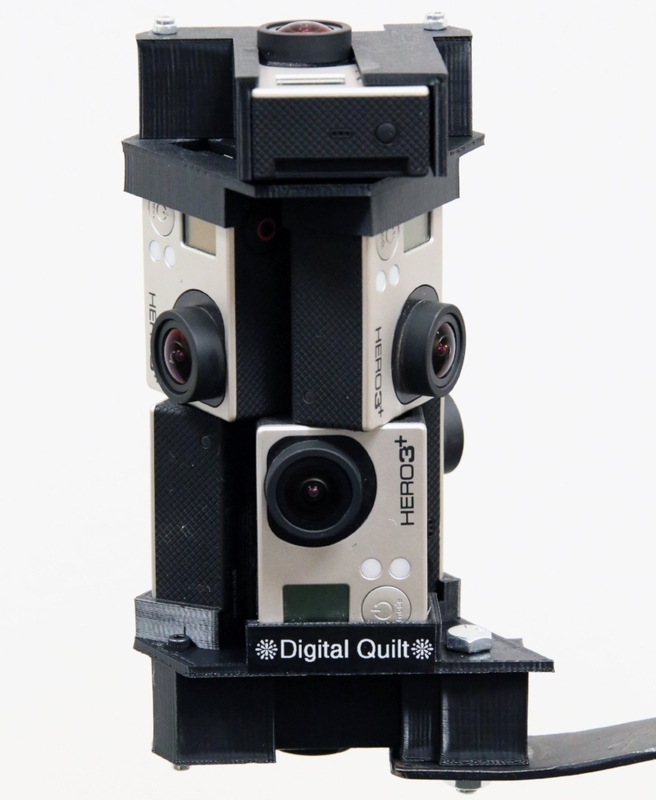 Smallest distance between lenses of any current GoPro rig allowing for easier image stitching.